Citation Information: J Clin Invest. 2006;116(1):19-22. https://doi.org/10.1172/JCI27490. 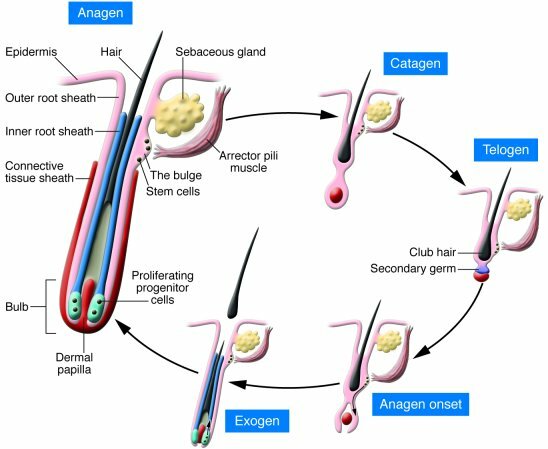 Cyclical changes in hair follicle growth are divided into different stages, referred to as anagen, catagen, telogen, and exogen. Hair follicle stem cells localize to the bulge at the bottom of the permanent follicle at the site of arrector pili muscle attachment. During anagen, rapidly proliferating progenitor cells in the bulb generate the hair and its surrounding inner root sheath. The onset of catagen is marked by cessation of proliferation and apoptosis of the epithelial cells below the bulge. The mesenchymally derived dermal papilla survives catagen and moves upward to abut the lowermost portion of the bulge, which then forms the secondary germ at its base, during telogen. Ill-defined mesenchymal-epithelial interactions likely involving BMP and WNT signaling are thought to signal anagen onset and the generation of the new lower follicle and hair shaft. As the new hair grows in, the old hair is shed during exogen. The duration of each stage varies depending on the type, site, and genetic programming of the follicle.